You can help us by making a donation with Charity Choice. Click here to go directly to the donation page. * 100% of any monies donated will go directly to Meningitis Association Scotland. You can help to increase the real value of your donation Meningitis Association Scotland by signing up for Gift Aid Donations. By signing up, it allows us to claim the basic rate tax on your donation. 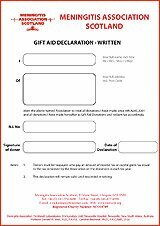 You can download and fill in the Gift Aid Donation form here. Every bit of money you are able to afford goes a long way in supporting the ongoing research into the battle against Meningitis. 8 - Provision of Specialist equipment for Hospitals Clinics and Families of victims. Pioneering work at Yorkhill Children's Hospital on treatment of severe disease was made possible through equipment supplied by MAS. Provision of necessary equipment for sophisticated epidemiology and monitoring of the disease by the Scottish Meningococcal and Pneumococcal Reference Laboratory (SMPRL) at Stobhill Hospital. We provide vital equipment for Families who cannot obtain these from other sources.